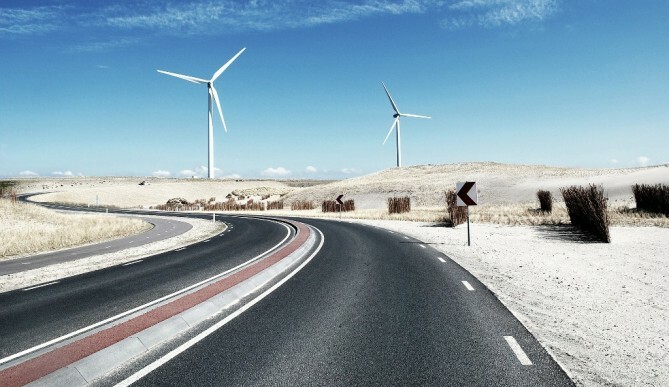 Smart use of non-renewable raw materials and energy sources is an absolute must. Protecting the climate is a prerequisite for the preservation of our basic necessities of life. Throughout the world, the consumption of resources must be reduced in absolute terms and the efficiency of those resources enhanced. The ecological Footprint of countries may not broaden further. Resources that take the form of biocapacity must be maintained and increased further. Economic systems must be weaned of their carbon-dependency and material-flow loops need to be closed. Climate change creates numerous ecological and social challenges. Economies and market participants will have to deal with them in the near future. The graph shows the change in annual average temperature in degrees Celsius for each grid point of earth’s surface. The change is measured between the years 1901 and 2012. Blue areas indicate a dropping temperature in this timeframe. 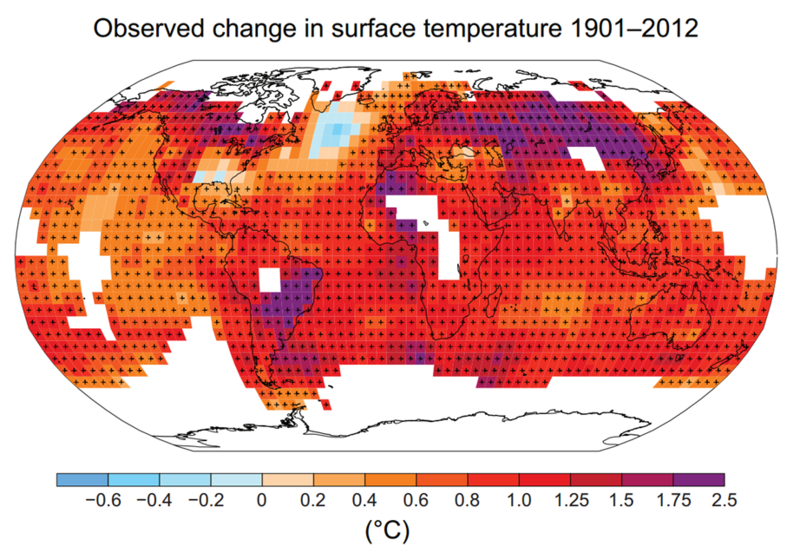 Red and purple shading show areas where the earth’s surface has become warmer. White spots indicate missing or incomplete data. Grid points marked with a cross show statistically significant differences. This graph was published by the Intergovernmental Panel on Climate Change (IPCC) in the 2013 Summary for Policy Makers of the 5th Assessment Report. Climate change is threatening the existence of entire ecosystems. Human beings are among the affected organisms. Increasing occurrence of natural disasters, dropping agricultural yields, species on the brink of extinction, increasing water scarcity and rising sea levels are but a few examples from a long list of long-term effects of climate change. Climate change is the biggest market failure in human history according to the 2006 Stern Review. It estimates that if mankind does not act, the overall costs and risks of climate change will be equivalent to losing at least 5% of global GDP each year, now and forever. If a wider range of risks and impacts is taken into account, the estimates of damage could rise to 20% of GDP or more. The current mitigation measures are not sufficient to prevent this. Governments are facing increasing public pressure to fight climate change. Sooner or later they will have to act in one way or another. Companies that have implemented mitigation measures in their business processes will enjoy a competitive advantage when new legislation is put in place. The same is true for investors’ portfolios. Many industries will have to reduce their emissions in the future. High necessity for improvement translates to higher financial risks on a company level. Risks that affect profitability, solvency and stock prices. 30% of the CO2 emitted by mankind has been absorbed by the oceans. Ocean acidification is a direct result of this development. Mankind has emitted an estimated 555 gigatonnes of carbon to the atmosphere since 1750. One gigatonne is equivalent to one billion tonnes. Methane and CO2 concentrations in the atmosphere are now higher than at any point in time in the last 800,000 years. When assessing a company’s contribution to climate change, we use the statements and scenarios provided by the IPCC as a baseline. The information published in the «Summary for Policymakers» is more than a scientific consensus. The statements contained in this report are agreed upon by all 195 current member states of the IPCC.